In the Argeneau series, it’s always interesting to see the heroine’s (and sometimes the hero if he is the mortal one) reaction to the reality of immortals and life mates. This time around she knew about immortals, but the life mate part came as quite a bit of a surprise. To say their first interactions went a bit rocky is a hilarious understatement. Santo acted no better than a gruff brute, infuriating Pet to no end. It was rather amusing seeing him attempt to civilize himself and woo her. 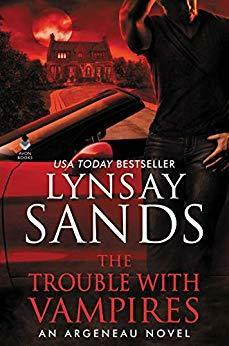 Meanwhile while all of the romance hijinks were going on, there was a larger plot and threat against them making for a balanced and engrossing read. I really enjoy books that balance a strong romance, but don’t forget to add decent focus to a strong plot. Don’t get me wrong, I love romance just as much as the next gal, but when I’m in the mood for more, adding a great plot sells it for me. And THE TROUBLE WITH VAMPIRES more than delivered. If you enjoy paranormal romance, and a long running series that is guaranteed to entertain, the Argeneau series is a perfect choice. Twenty six books in and this series is still going incredibly strong. I really look forward to each new release and THE TROUBLE WITH VAMPIRES was no exception. All in all, a fantastically entertaining read, fans of the series will be more than pleased.